But the ride is what the family will like. Edge’s suspension is tuned to control rough Midwest roads and coddle passengers without making them feel they are floating along on a pillow. There’s little jostling and even railroad tracks don’t disturb the ride. Handling also is good, maybe a bit heavier steering than in some crossovers, but turn-in at corners is fairly quick and any play in the wheel is minor. 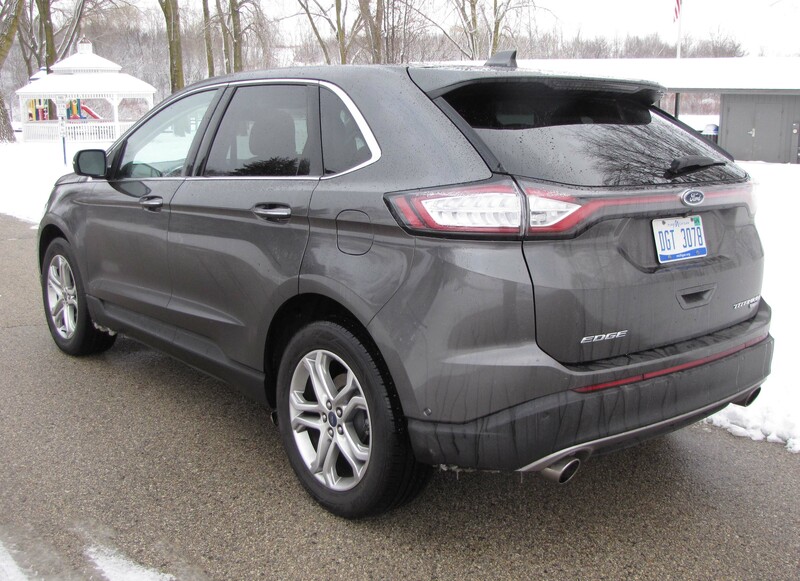 Ford has really stepped up the handling throughout its lineup the past few years. This model also comes with AWD, so is sure-footed in snow and slush. We haven’t had much so far this winter, but I got this one the day after our first sloppy dump and many side streets were still covered with snow and ice. Edge handled it all with ease. Standard too is stability and traction control. 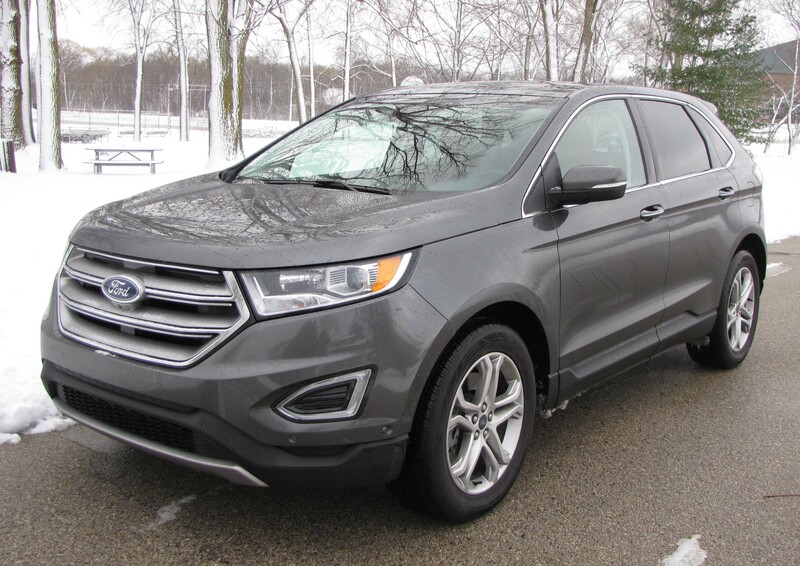 Along with its ride, the family will like Edge’s quiet interior and its style and comfort. The Titanium model has leather seats and this one featured a two-tone look with a black over brown interior. Seats were well contoured, comfortable brown leather while the dash and doors were black. The leather is soft and rich feeling too. 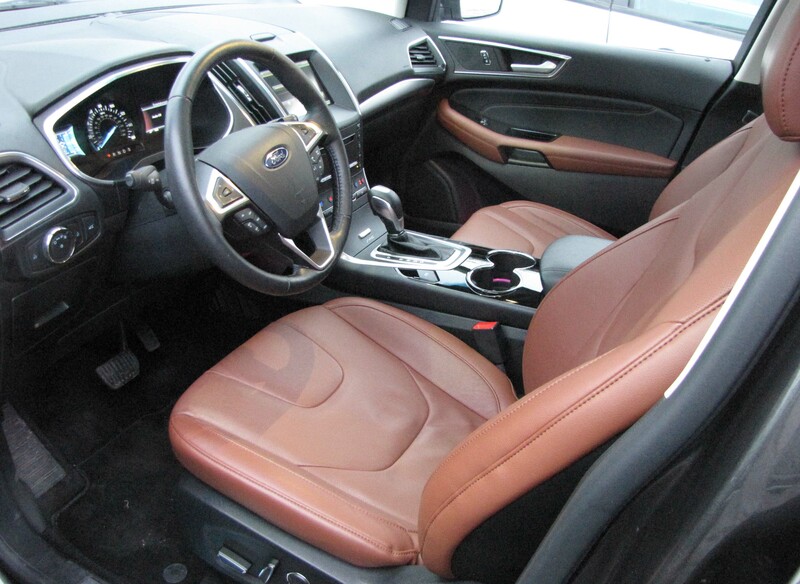 Power seats with three memory settings for the driver, a power lumbar, plus three-speed heated and cooled front seats made this Edge a good winter ride. Oh, and the rear seats are heated too, as is the steering wheel, something all cars in our clime should offer. All that heat is part of a pricey ($5,645) option package. But I’m guessing this one will be a pretty popular option in northern states. The hefty package also includes a monster panoramic sunroof, and who doesn’t like that? It includes a power inner cover which helps keep the Edge a little warmer in cold weather. Other features in the package include a voice-activated navigation system, blind-spot monitoring system, remote start, automatically dimming driver’s mirror, lane departure warning, park assist and a180-degree front camera. You can argue the value of some of this, but most folks would like the majority of the items in this package. Sadly its addition pushed the test crossover to $43,190 after a few discounts. That’s getting up there on the pricing totem for families earning even slightly above average incomes. Still, the dash is well laid out and the controls simple to figure out and reach for those who can afford this more upscale model. 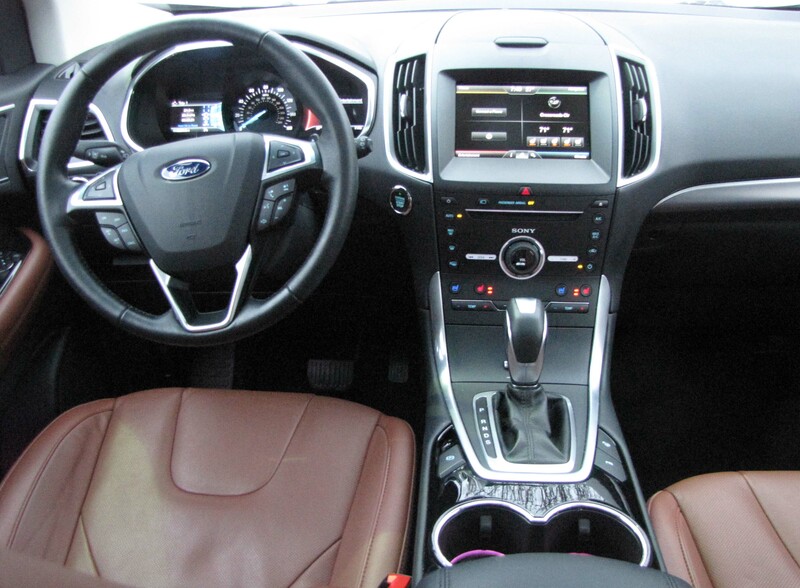 Ford uses buttons on the center stack, so not all touch points as in some of its other models. That’s good because these all work, even the smaller buttons could be punched while wearing gloves. There is a touchscreen to operate the HD radio, nav, phone and climate systems, but there are some knobs and buttons as backup for vital functions. While the only way to turn on the heated steering wheel was via the touchscreen, radio volume and cabin temperatures were easily handled by buttons or toggles. Edge’s rear seats will fold flat and the rear hatch is powered so loading is easy. Cargo room is plentiful. There’s also push button start, trip computer, cruise and phone buttons on the manual tilt/telescope steering wheel’s hub, and a camera button on the center stack to get a closer view of the nose of your car and its sides as you’re backing out, or pulling in, to a parking spot. The park assist system beeps at you too as you approach curbs or snow banks and there’s lane departure on a stalk to the left of the steering wheel. I had it off for most of the test drive. 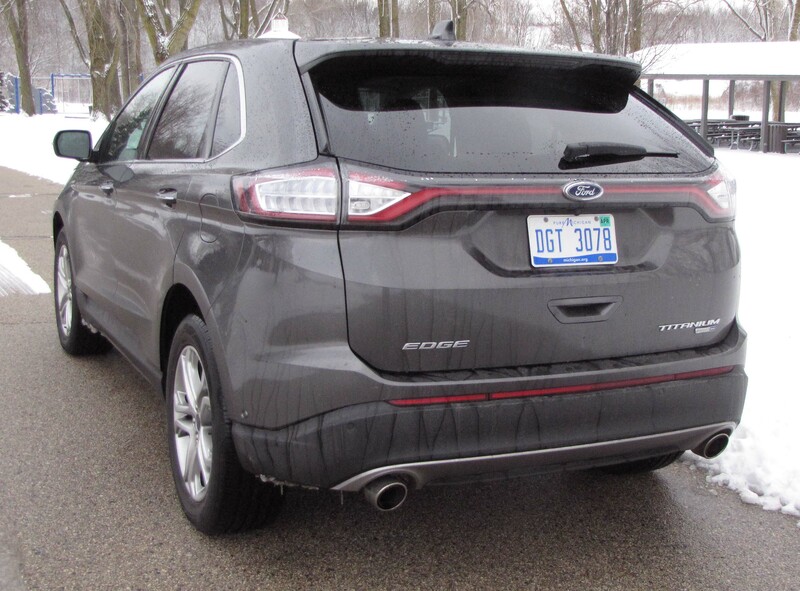 It’s a bit ironic that so many cars, including Edge, have such a variety of warning systems and cameras, yet the vehicles are built with giant A pillars and side mirrors that block your ¾ front view in a big way. But at least you do have a camera to help you see around the car now. Considering this uses the EcoBoost, which is turbocharged to help increase power but maintain reasonable gas mileage, I was disappointed in my fuel mileage of 21.7 mpg. The EPA rates this at 20 mpg city and 28 highway and about 70% of my driving was highway miles. On the plus side, Ford uses a capless fuel filler, so you don’t have to fumble with a gas cap when filling up on a cold morning. Ultimately Edge is a handsome, powerful and comfortable crossover that will fit many families’ needs. A base SE with front-wheel-drive starts at $28,995, so a bit below today’s average vehicle price. There also is an SEL trim level before Titanium so finding a mid-$30 grand model with the equipment you need is certainly possible. 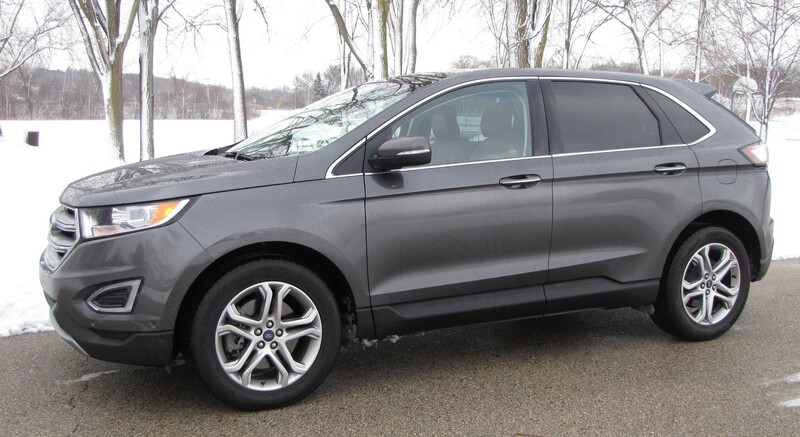 Hits: Handsome crossover, excellent ride, good handling and power, plus AWD. Panoramic sunroof, heated rear seats and steering wheel, power hatch, comfortable seats and good dash controls and layout. Misses: Option package makes this pricey and gas mileage is so-so. Big A-pillar obscures side vision.